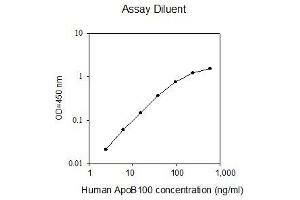 Purpose Human ApoB100 ELISA Kit for cell culture supernatants, plasma, and serum samples. Specificity This ELISA antibody pair detects human ApoB100. Other species not determined. 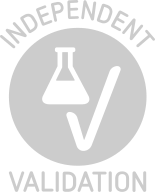 Add 100 μL of standard or sample to each well. Add 100 μL of prepared biotin antibody to each well. Add 100 μL of prepared Streptavidin solution to each well. Add 100 μL of TMB One-Step Substrate Reagent to each well. Add 50 μL of Stop Solution to each well. For example, add 2 μL of serum or plasma into a tube with 98 μL 1X Assay Diluent to prepare a 50-fold diluted sample. Mix thoroughly and then pipette 2 μL of prepared 50-fold diluted sample into a tube with 398 μL 1X Assay Diluent to prepare a final 10,000-fold diluted sample.